There are many reasons to become a writer. Fame, money, chicks/guys. But as the real writer knows, the main reason for writing is to give you a plausible excuse to spend the equivalent of this month’s mortgage payment at the stationery shop. I get all excited when I see the “Back to School” sales starting up, even though I left school back in the dark ages and I have no kids. But those sales mean half-price notebooks! Money off pens! Cheap notecards! Get outta the way, kid, lemme at ’em! What stationery pervert can resist the waspy beauty of the classic Steadtler Norris pencil? Or the intoxicating scent of a Sharpie? (don’t inhale!) Or the luxury of the Moleskine? My favourite stationery item I own just now. There's the diary peeking out for under a lush new journal. 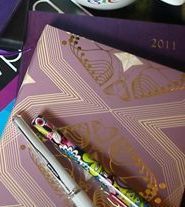 Last December I found an absolutely gorgeous page a day diary for 2011, with a purple tafetta cover, a purple bookmark ribbon and the pages edged in gold stuff. It was love at first sight, and all the more surprising for it being from WH Smith, a shop it’s become less and less of a pleasure to visit lately. (Unless you want an enormous chocolate bar for £1 and not to be able to get your purchases onto the counter because of all the crap they have crammed on there. Seriously, Smiths, what’s happened to you? You’re awful now.) But I digress. This diary is so lovely and being a diary I get to write in it every day. I’ve got a few fountain pens, but this is my favourite just now, a Cross that my brother and sister in law gave me a couple of Christmases ago. My favourite of the more throwaway type remains the Uni-Ball Vision Elite rollerball. It writes so smooth and easy,barely any pressure needed, so you can write for hours before your hand gets tired. Also apparently it doesn’t explode on planes. Which has to be a good thing. Good to know the boffins at Uni-Ball were hard at work on a problem I didn’t know existed. Uni-Ball do lots of pens that I love. But when it comes to editing I go for the Pilot G-Tec-C4 . It’s so fine, but not scratchy, it’s great for writing between the lines and in the margins of my MS. I usuallly use red of course, but it’s available in loads of colours, so I’m known to edit in purple, green, pink, blue, whatever I fancy. I’m a rebel. No-one can stop me. But I do keep coming back to my favourites – Pukka Pads. Especially the Shortie which is an interesting size, between standard A5 and A4 pads. I believe these aren’t all that readily available outside the UK – what a shame! Whatever notebooks I’m using I generally like it to have a bit of heft to it. If it’s a spiral bound pad it’s got to be classifiable as “chunky”. Possibly best notebook ever, belongs to a friend and fellow writer Teresa Morgan – check her out at her blog,The Wittering Woman. A friend of hers, through some kind of magic I’m not clear on, got the title of the novel she’s working on mocked up into a classic Mills and Boon type cover and then put on the cover of a notebook. Now that’s clever. And it must be quite motivating while using it! I can’t be the only stationery fetishist out there. Tell me what you you have hidden in your bulging stationery drawers or cupboards. I’ll just wait over here, fondling my Uni-Balls. Hmmm… I have to admit, I don’t own all that much stationary and use the computer for a lot of my notetaking and organisation. I also get intimidated by fancy notebooks as I don’t want to besmirch them in any way. However, give me the back of an old envelope (the ones from HMRC are particularly good – sturdy and A4 sized) and a sharp 2B pencil and I’m happy. Yeah, I used to have the “this notebook is too pretty to actually use!” thing, but I got over it in the end. Interesting that about a pencil, it’s very rare I’d write in pencil – though I have art training too! 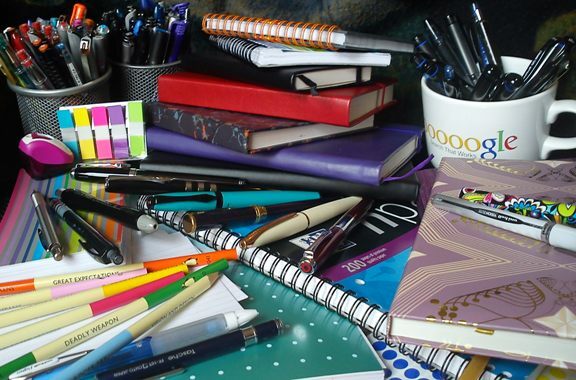 I adore stationery too, and had I any kind of funds I’d have as many pens as you! I really miss working in a office as I never have a pen–and I have a competition to enter and need ONE paper clip!!! Idon’t think they sell them in ones. I love your penguin pencils. I think you can order those notebooks on the internet or somewhere. She knew the title of my book because I’d let her read it and she did inquire to what my ‘pen’ name would be and I said I wanted to go with my real name if I could, and then a few weeks later she presented me with my present. I still haven’t used it yet… not sure what to start using it for. 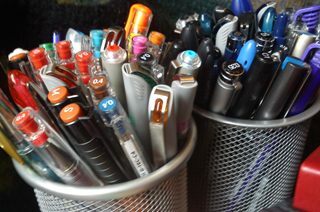 Oh and I seriously don’t have a pen collection like yours. I like stationery but don’t have the money to buy loads, plus I do work from my PC loads. Thanks for a plug to my blog. I’ll be updating it tomorrow about the RNA conference. Just too tired tonight. But next year is in Penrith – so that’s close for you! Nightmare for me, but I SOOOOO want to go again. Penrith, ooh, I like it. That’s easy on the train. Scenic journey over to Carlisle, one change and on to Penrith. Takes under two hours.